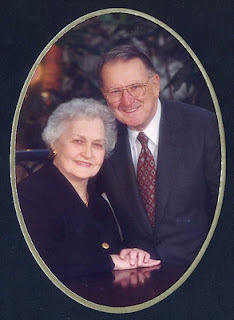 On February 18, 2009, my wonderful grandma died. 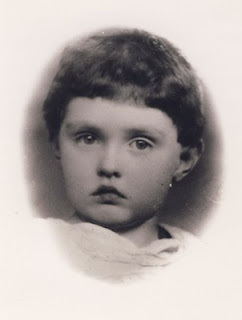 She was 85 years old and the mother of seven children, the grandmother to thirteen, and great grandmother to five. 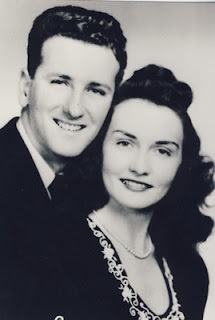 Before his death in 1995, my grandma and grandpa celebrated 51 years of marriage. He retired as a captain in the Coast Guard and my grandma was the force that held her family together through many moves and duty station changes. I love you, Grandma and Grandpa, and I miss both of you so very very much. I am glad you are together again now, but I miss you so very very much. Grandma, I can't even bear to imagine celebrating our birthday without you--we have been birthday twins my entire life. Leaving you at the cemetery was one of the hardest things I've ever done in my life. I love you and always will love you. Handsome's procedures at Children's Hospital started at 2pm on Thursday. He wanted nothing to do with the hospital gown, so he went back to the operating room holding his Ted and wearing nothing except a pull-up. He looked adorable, of course! Evidently they clothed him once he was under anesthesia, because he came back to me wearing a gown. I went out to a family conference room and anxiously waited for the first doctor to come out. my husband was at home with our five year old, so I was by myself. It took awhile, but the first doctor came out and told me he was done with the bronchoscopy and laryngoscopy and everything looked perfect--no clefts anywhere!! Woohoo!! This was the news I was expecting, but it still was good to hear. :) Then he gave me color glossy photographs of Handsome's vocal cords. Pretty neat! I waited for awhile longer before the next doctor came out. This time it was the GI doctor. Handsome's endoscopy looked GREAT and so did his tummy--no ulcers, no twists in the duodenum. And, his tummy showed no visible signs (ie irritation, redness, etc) of food allergies. He took biopsies as well and we'll get those results later. Aaaaand, he gave me color glossy pictures too! Pictures of stomach acid (bubbles! ), tummy, esophagus...all looking nice and healthy. After that Handsome was off to the MRI (I didn't see him between any of these procedures and he was under anesthesia for everything.) Finally I found out what his hospital room would be, so I headed there to wait for him. 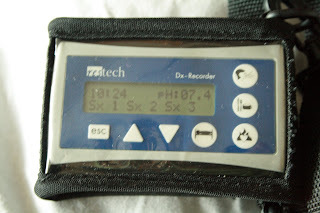 After his MRI, his resTech probe was placed before he woke up from the anesthesia. This is a new kind of probe that Children's has just started using. It was threaded through his nose and into the back of his mouth (most ph probes go way farther down.) The point of this probe was to see how often he refluxed so high up that he risked aspirating stomach acid. While I was waiting for him, someone came from the GI lab to give me instructions on the probe. 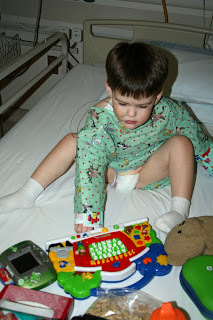 I had a little (palm size) computer to push buttons on every time he coughed, ate, sat down, etc. Plus a log to fill out that documented everything he did for the next 24 hours. At about 4:30pm, I heard Handsome crying down the hall--turns out I could hear him while he was still in the elevator. My boy is LOUD! He was still groggy and was very unhappy. A nurse brought him down the hall in a wheeled crib and he was one upset baby. He was most upset that both his arms were restrained so that he couldn't bend them and yank out the probe. He screamed for the next 1.5 hours or so...it was pretty miserable. At one point he managed to rip off one of his restraints--that shocked the nurses! He also kept clawing at the IV ports that still were in his hand. I was so nervous that he was going to rip those out!! 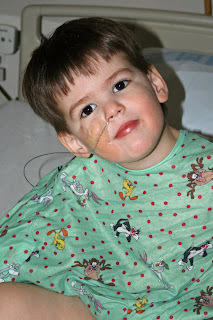 He screamed even louder and kicked and flailed when the nurse tried to take his blood pressure and listen to his heart--he usually LOVES that kind of stuff, but he obviously was scared of all procedures at this point. Poor baby. (You can see one of his restraints sticking out from his gown in this picture...he could only swipe at the toys...not very fun!) 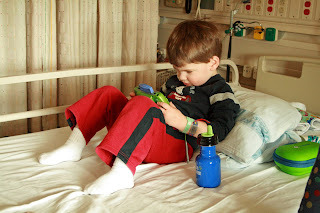 We went back to the room and I petitioned the nurse (again!) to get permission to remove the IV ports from his hand--I knew they wouldn't be needed. She was really reluctant, but finally called the GI residents who were on call. They came fairly quickly and were really nice. Luckily they agreed that the IV port should come out. The nurse took Handsome's left arm restraint off to get the IV port out (the restraints went from his arm pits all the way down past his knuckles.) He was SO much happier with the one restraint off, so I had her leave it off so that he could feed himself. 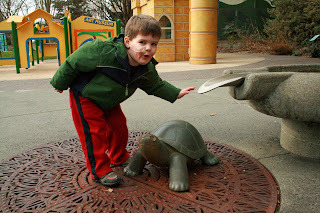 Plus the probe was taped onto his right cheek, so it was harder for him to reach anyhow. 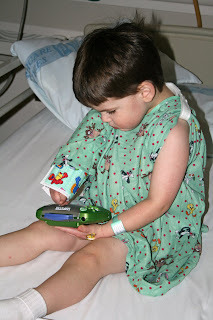 (Here he is with just one arm board on--he was much happier like this!) He was a lot better after that. The only problem was that he wanted NOTHING to do with hospital food. He spent the next 24 hours eating cheerios, applesauce, and animal crackers. Oh and he consented to eat a banana. He would only drink water. And he hardly wanted any food at all--his eating was NOTHING like it is at home. NOTHING at all like it. :( So frustrating. I don't think he even refluxed once...probably because he was eating bland food and just picking at stuff. This is my child who refluxes all.the.freaking.time at home. Soooo frustrating!! Anyhow, my mom came to see him in the evening and we went for a walk around the hospital. I let him stay up late in the hope that it would make him more tired (it didn't!) and then we crawled into bed together. I spent the night watching him because I was scared he would accidentally pull the probe out. Any time his free hand wandered near his face, I moved it down. It was a long exhausting night. Every time the nurses came in, they were amazed I was awake. I was soooooo tired...but he kept that probe in! In the morning we received the wonderful news that his MRI was clear!! No more worrying about his brain pushing on his spinal column and the nerves in that area! Phew!!! This was FANTASTIC news! Handsome was doing a good job not touching the probe, so in the morning I took the second restraint off and he was a lot happier. 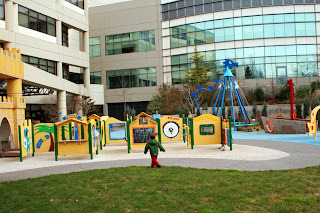 Handsome and I spent more time exploring the hospital, playing in the playroom, and playing outside in the play-yard. He also spent a lot of time playing his Leapster, which he loved! At home I ration his Leapster time pretty strictly. We had fun together and he did not want to leave the hospital! He told me he wanted Mama-Handsome time all the time and cried when I told him that we had to leave the hospital. The probe was taped onto his cheek REALLY securely. It was plastered on from just below his eye, down to his chin and from the side of his nose, almost back to his ear. They were really worried he'd yank it out! Anyhow, it was miserable for him to have all that sticky stuff yanked off his face and it didn't help that his eczema was acting up--he ended up with bloody patches on his face. :( Poor baby. 24 hours after we entered the hospital, we were cleared to leave...my little guy was so sad--he loves the hospital now! I'm hoping he was groggy enough when he first arrived in his hospital room that he doesn't remember those miserable first couple of hours. We go back again in a week or two (I need to schedule the appointment) for the results of the probe and the biopsies--but I doubt anything showed results. I'm so frustrated by the probe because I know the results will be skewed by his lack of eating and the bland foods that he did ingest. We've been home for a few days now and he's back to his regular refluxing...SO FRUSTRATING!!! Don't get me wrong--I'm thrilled with most of the test results...just upset that the one thing that we KNOW is a problem is giving us a skewed result. 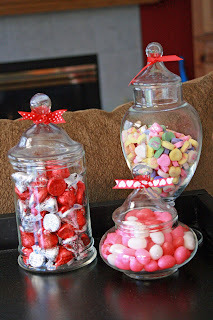 Today is the day I take Handsome to the hospital and, since we'll be staying overnight, I had to make Princess's Valentine treats ahead of time. 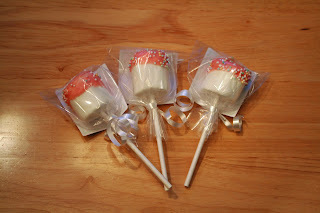 For her preschool classmates, I made marshmallow pops. They were so easy to make and turned out so cute! 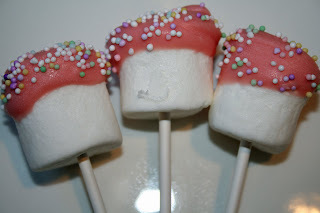 I stuck a stick in the marshmallow, twirled the top of the marshmallow in pink candy melt and added some sprinkles...that was it! After the candy part cooled, I put them in plastic bags with cute little labels from Autumn Leah Designs on etsy. The packages look cute from the front and the back! 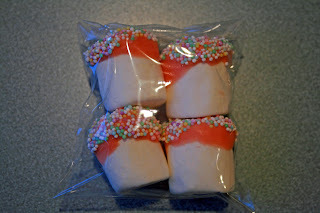 I also dipped some marshmallows with no sticks as part of the teacher treat bags. They look pretty cute too! I used the same sticker labels on these--this time I used them to seal the little bags. 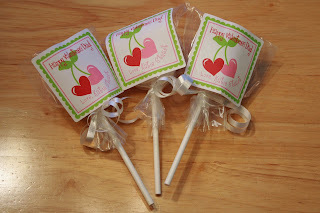 I also made other treats for the teachers for Valentine's Day. I was inspired by Allie at No Time for Flashcards and made Red Hot Bark--it was just as easy to make as peppermint bark! 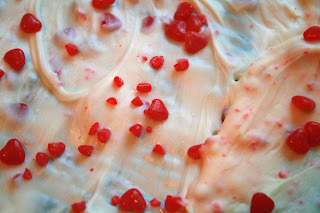 First a layer of chocolate, then a layer of white chocolate mixed with red hots (some smashed, some not.) Tastes great and not too "hot" at all! 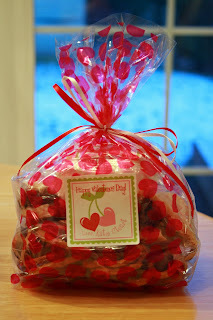 The other treat I made for them is one that I make for lots of holidays and it always is a hit! 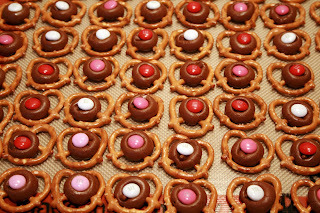 Pretzels with Hershey Kisses and M&Ms. Mmmm, the mix of chocolate and salt is sooo good. And, the great part is that little ones can help with making these! This time around I made them by myself, but at Christmas time my 5 year old was a lot of help and made them almost entirely by herself--she did everything except the last step. First preheat your oven--I usually do these at 250 degrees. 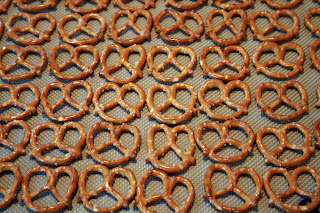 Then lay out a cookie sheet full of pretzels--make sure you have Silpat (love my Silpat--I've been using it for years!) or foil under them so the chocolate doesn't stick to your cookie sheet. 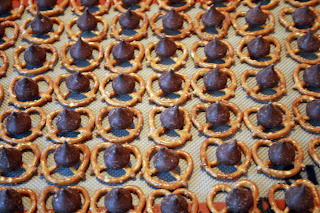 Then you balance a Hershey Kiss on each pretzel. Next you pop them in the oven. Mine typically take 5-6 minutes in my electric oven at 250 degrees. You can always test with an M&M to see if your Kisses are squishy enough. Don't overcook the chocolate--you can't bring it back if you over do it! 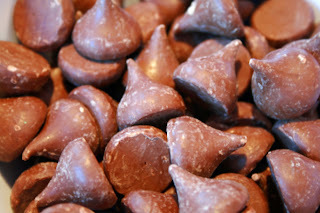 Once the Kisses are glistening and easy to squish, take them out of the oven and use an M&M to squish down the top of each Kiss. Now you just wait FOREVER for them to cool and the chocolate to harden. I suppose you could speed things up by putting them in the fridge, but I try to avoid that because sometimes it causes the chocolate to change color a bit. My favorite thing to do is to let them cool on the trays overnight--I just tent some foil over the tray and leave them out. 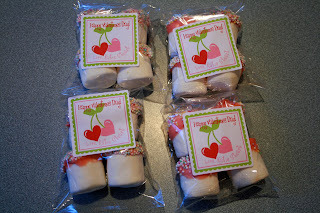 I packaged each treat in bags and then put them together into little Valentine care packages for the teachers. I hope they like them! I had plans for a fun post today, but I'm too upset. An hour ago I received the call from Children's Hospital regarding Handsome's instructions for tomorrow. I am NOT happy about these instructions and not at all happy that we weren't warned in advance about this. Maybe it is all my fault for not asking the right questions though. I don't know. I'm sitting here in tears because I don't know what to do. I'm sorry if this isn't coherent, but I need to get this out. Tomorrow Handsome has procedures scheduled at 2pm. A lot of procedures. He'll be going under anesthesia for an endoscopy, a laryngoscopy, a ph probe, and a lengthy MRI. Obviously we knew there would be eating restrictions for anesthesia. However NOBODY warned us about the severe eating restrictions for the scopes. As of noon today he can have only pudding, milk, and yogurt. As of 7pm tonight he can have water and apple juice. He doesn't like juice, so that means just water. As of 10am tomorrow, he can have nothing at all. His procedures start at 2pm--there is NO WAY my three year old (barely three!!) will understand not being able to eat for 19 hours...plus three hours or so for the procedures...so that is putting him close to 24 hours with no food. I'm just not convinced the scopes are worth him not eating for 19-24 hours...yes, they're important, but I don't feel they're as important as his other tests. Now that I know how strict these eating instructions are, I want to know why this wasn't scheduled for first thing in the morning. Instead he's going to go to bed a little bit hungry and wake up starving...and then not eat until dinnertime! I have calls in with the GI clinic at the hospital to find out if there is ANY flexibility with these requirements. If there isn't flexibility, then I don't know what to do. I'm so upset right now. 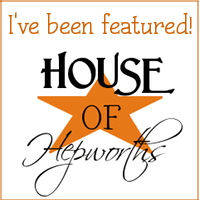 From Awkward Coat Closet to Fun Toy Closet! In our small family room, we have an awkward coat closet that angles back under the stairs. 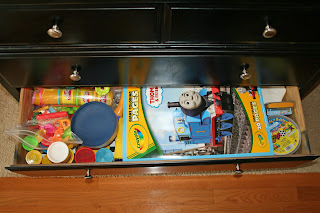 Up until two years ago, we just had it stuffed with random items and then had the children's train table pushed up against the door so they would stay out of the closet. It made the closet rather useless and the train table difficult to use. So, two years ago I decided to make it over as a surprise for my little ones! 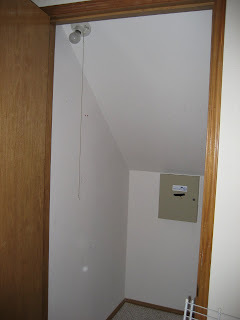 I don't have a really good before picture with all the junk in there, but here is mostly what it looked like--dingy paint, a light fixture with a pull string, a metal wall box with our house alarm mechanics, and a single wire shelf running across the back of the closet. Not very pretty!! 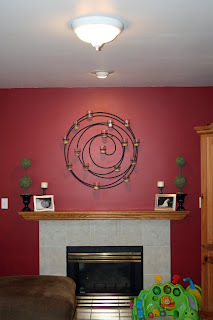 My husband's contribution to this project was to convert the pull-string light to a regular light fixture with a wall switch. At the end of the project he removed the door from the closet and sanded down the hinge plates so there wouldn't be any rough edges for the children to hurt themselves. We kept the door on the closet until I was done with the makeover because this was a big surprise for my children. 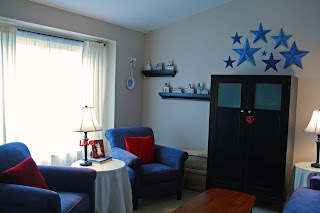 I wanted to make it a light and bright space for my children, so I painted the entire closet blue and painted the trim white. Next I painted puffy white clouds using a sea sponge. 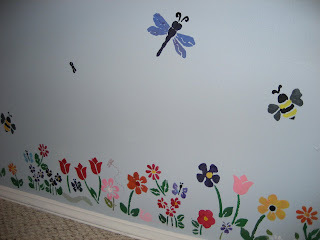 Then I stenciled on flowers and little bugs in bright colors. I wasn't sure how to cover up that metal box, so I used my staple gun and put up a piece of fabric. 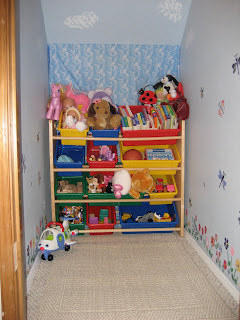 Then I put a toy shelf in front of the fabric so that little hands wouldn't pull the fabric off the wall. Another problem was the access panel in the floor that is used to get to the crawl space under the house. I covered up that area with a small area rug--I didn't want the children picking at the carpet edges on the panel access area. 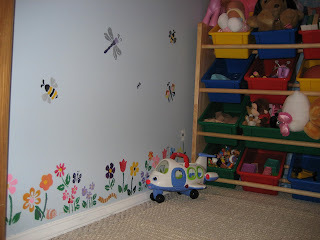 After that, I hung some small butterflies from clear thread in the ceiling (of course I don't have a picture of that!) and I was done. 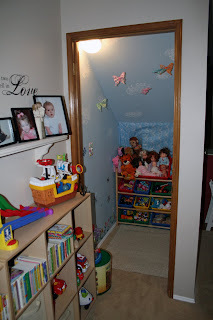 My children LOVED the space and used to spend lots of time playing in the closet. It was a great way to add more space to our family room. Now that it has been two years, they don't really play in there any more...so this summer I think I'll be changing it to a book nook for them. I'll change out the toy rack for a bookshelf and give them some comfy pillows to lounge on. I just want to wait until after we do our small construction project this spring. For more fun ideas, visit The Lazy Organizer for more Talk about Tuesday posts! 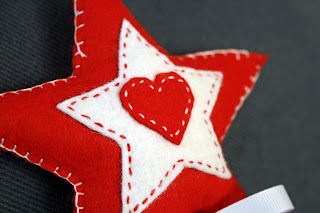 I had plans for more Valentine decorations, including some that I was hoping to have Princess make with me, but since the big day is less than a week away, I think what I have up is all there will be this year! Hey look, it's the garage sale dresser that I redid! I wonder how many times I can blog about it? Anyhow, it is one of the few flat surfaces I have to decorate, so here it is again! This is my Tuesday Morning (discount store) lamp with a lampshade from Target--I'm going to add a little something-something to the shade, but haven't done that project yet. 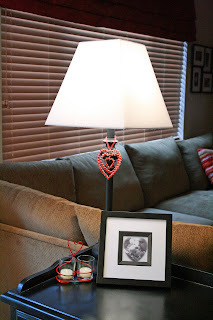 I have a beaded heart (from Michael's) hanging from the lamp, a cute little heart candle holder, and a sweet little snapshot my mom took on Princess's first Christmas--then she had it printed in a heart shape and framed it for me. I love it. No, I *love* it!! This is my little candleholder from Nordstrom Rack--basically that is Nordstrom's outlet store. I was at one (a couple hours from home) in mid-January and couldn't pass this up...I think it was $2.99!! These are my mini apothecary jars that I found at an antique store. I think it was around $10 for all three of them. Sooo cheap compared to everything else in the store! The jellybeans are the only thing I bought specifically for this little vignette. The kisses are leftover from Christmas--I just picked out the green ones! The conversation hearts are from 2001! Don't eat one, you'll break your teeth! My husband proposed marriage to me using conversation hearts, so we incorporated them in our wedding favors and I had a few leftover bags that I've been holding onto because it seems wrong to throw them away. 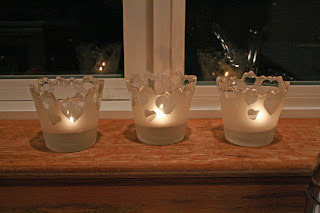 These glass votive holders with little hearts are another find from The Rack. 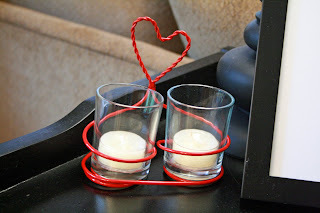 Love them and they were super inexpensive, too! Isn't my "distressed" window sill lovely? This is my kitchen window and is yet another unfinished project! This is my formal living room that you see as soon as you walk in the house. What isn't in this picture (because I'm leaning over it!) is the GIGANTIC empty cardboard box that Santa brought Princess for Christmas. It is all she asked him for and she loves it. 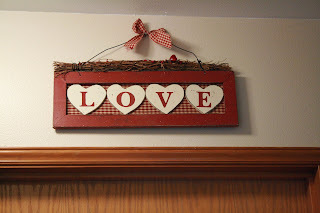 My cute little "love" sign is hanging from the lamp on the left and another beaded heart is hanging from the armoire. By the way, that's an Ikea armoire--I frosted the glass and painted the whole thing black. Our desktop computer is tucked away inside. Finally I have this cute sign hanging above the door to my laundry room/powder room. I really like it and was happy to find it on sale at Michaels for less than $6. We've selected our contractor and soon will be meeting with a designer--we are bumping out the back wall of our teeny family room and the eating nook off the kitchen!! I am SO excited about this!! We have been talking about doing this for a couple of years and it looks like the project will start in March!! Enlarging these two areas will be so great for our family as we spend so much of our time in these spaces. We'll finally be able to use our real kitchen table (from our last home) in the kitchen and seat more than three people at a time--currently that table is in our not-so-formal dining room. Plus our family room will have floor space for playing! Oh it will be wonderful!! And, did I mention, we're hoping to lower our utility bills too--our gas fireplace is so cold and drafty and so is our family room window. Replacing them will be great! With that said, I need some lighting advice/help! When we moved in here, we removed the dated and unnecessary ceiling fan from the family room and just replaced it with an ugly overhead light that we removed from another room in the house. I don't like the light AT ALL (it looks like a big n!pple on the ceiling!) and we never use it. Now is my chance to replace it...but I don't know what to do! Another chandelier! This one is in the dining room. So, that would be three chandeliers--will that look strange? In my head it seems like chandelier overload! 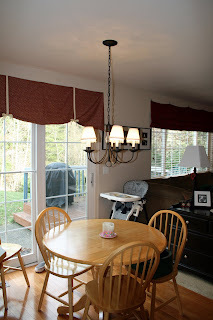 This chandelier (over the kitchen table) will be moving a bit though--so the light fixtures won't be all in a row the way they are now. Look out the window--you can see the edge of the deck and patio--that's how far we're bumping out the wall. 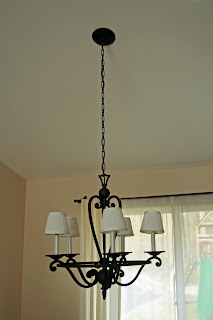 So, the chandelier will move to just about where the sliding door is now. What to do, what to do?! Help, please!! No ceiling fans though--they aren't my style and they aren't necessary in our house/climate. 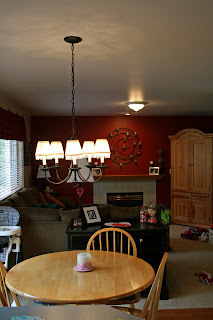 Oh, and the dining room chandelier and kitchen chandelier are staying because I like them and selected them myself. They aren't fancy, but they're definitely my style! 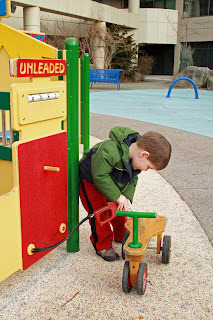 Wendy at The Shabby Nest is having a "Taming Kids' Clutter" link party! My little ones have LOTS of stuff, so I am loving this!! I've posted before about my wall of cubbies in the family room. 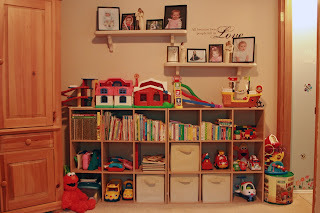 It is fantastic storage for my children's toys and works really well for our family. My children love having a place for everything and it makes cleanup very easy for them. Actually, that post from last summer gets a lot of hits from Google -- I think there are a lot of parents out there who are looking for toy storage ideas! This is the picture from last summer--things have been rearranged a bit, but the general idea is the same. I bought those cubbies at Target from the closet organization area, but I know Ikea has something similar. I've even seen it done where people arrange them like built-ins around a window and do a long storage unit under the window and then turn two units on end and put them on either side of the window. My storage units are "wood" colored, but they also come in white. A couple of years ago I turned an awkward closet under the stairs (also off our family room--to the right of the toy storage) into a toy closet for my children. I painted it with clouds and flowers, bugs, and butterflies and made it into a little haven for my children. In the back of the closet there is more toy storage--one of those racks with bins on it that I think so many of us have. My children really do like having a place to put each and every toy and both children do a great job of doing their own cleanup. 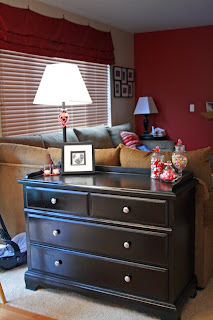 This dresser (which I'm using as a sofa table) is right off the eating area in my *small* kitchen/family room area. 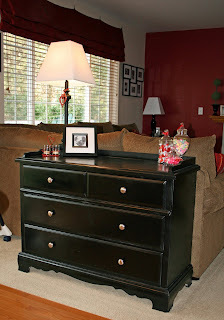 Yes, this is the garage sale dresser that I rehabbed. The drawers are full of art supplies for my children. 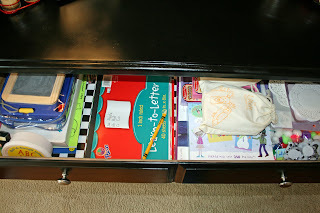 I had hoped they would be able to access the supplies by themselves, but the drawers are too heavy and don't have drawer stops--still, it is very easy for me to pull out what they need and put it on the kitchen table for them to use. The top drawer houses my Handwriting Without Tears stuff, current worksheets my 5 year old is doing (she loves them, crazy girl! ), art kits, and miscellaneous art supplies. 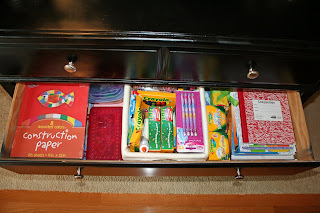 The middle drawer is the most used and has paper, coloring books, lots of crayons (in the basket), paints, and workbooks that we haven't used yet. The bottom drawer is half-filled with playdough supplies, stickers, Aquadoodle stuff, Perler beads, and the BIG coloring pages. I love being able to hide away all this "clutter" and yet still have these supplies readily accessible. 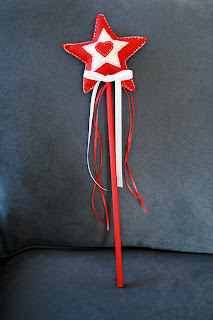 I saw an adorable princess wand on another blog and decided it was a "must-do" project! I modified it a little bit and added my own touches and...voila! A super-cute Valentine gift for my little girl! I still need to make one for my little boy and I think my two year old niece needs one too. It was so easy to make! I used wool felt, embroidery floss, pillow stuffing, a dowel (cut to size and painted with craft paint), ribbons, and a bit of hot glue. That was it! 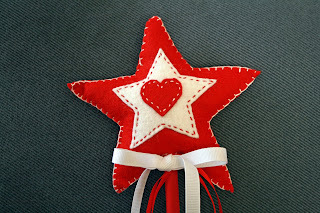 So cute and so easy to personalize to your liking. So cute and the little imperfections (such as my not-so-perfect blanket stitch!) just make it even cuter in my opinion!